Analytical Armadillo: Does spoon feeding predispose babies to obesity? "Spoon feeding 'makes babies fatter"
The impact of different weaning methods on food preferences and body mass index (BMI) in early childhood is not known. 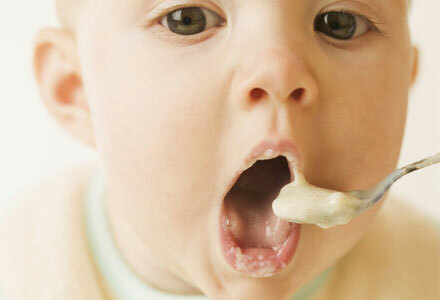 Here, we examine if weaning method—baby-led weaning versus traditional spoon feeding—influences food preferences and health-related outcomes. The reality is that the anecdotal comments on Facebook were ultimately nearly half the size of the study. It contained a mere 155 children, 92 given finger foods and 63 spoon fed. The age range was 20–78 months. The study examined weight and taste preferences. It's therefore definitely important to recognise the limitations of this study (and the authors do). No adjustment was made for early feeding method ie we know breastfed infants are exposed to different flavours via breastmilk, and therefore may well be part of forming "tastes". We need to look at what the first foods were in both groups because sweet foods such as baby rice have also been show longer term to impact on obesity levels. Ideally we also need a study of a much larger group and also over a much longer period of time ie what happens at puberty and beyond. Being slim and able to regulate ones appetite from a selection of healthy choices at 4, doesn't mean this will be the case at 20, 30 or 40. However - I still think it's worth studying the evidence a bit further; to work out exactly what it does and doesn't say, because as usual this seems to have caused a little confusion. "When researchers compared kids based on BMI, they found that kids who’d experienced old-fashioned spoon feeding were more likely to have become obese. In addition, those kids tended to rate sweets as their favourite foods. By contrast, the kids who’d experienced baby-led feeding showed a preference for carbohydrates, not sweets. And these kids were more likely to end up underweight." Note - it was parents who rated the children's taste preferences, not the kids. This means there is the potential for a variance in expectations and perceptions, plus the diet offered. 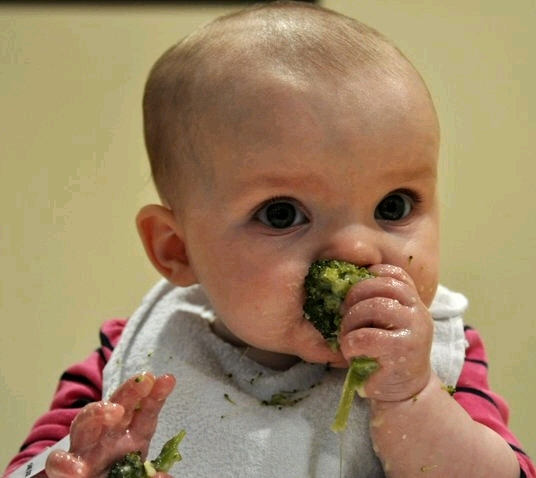 "So in this small survey, baby-led weaning was linked with skinnier kids." "BMI scores differed significantly between groups lower BMI were associated with baby-led weaning in the whole sample. The mean BMI percentile rank for the baby-led group was close to the expected average." "In contrast, the mean percentile rank for the spoon-fed group was above the average level, indicating that more children in this group were likely to be classed as overweight." "BMI z-scores were also found to differ significantly between the weaning groups. We found there to be an increased incidence of obese children in the spoon-fed group (n=8) as compared to the baby-led group (n=1)"
So you could phrase it that the "baby led weaned is linked with skinnier kids", but only if you are holding spoon fed, potentially heavier babies as the basis for comparison. Truth is the baby-led group was close to the expected average ie they were just normal weight. Furthermore 9 children were obese, 8 spoon fed and 1 baby led. 3 children were underweight, all baby led. Therefore the risk of overweight when spoon feeding was statistically much greater than the risk of being underweight was if baby led. What the study also doesn't tell us is what the child's position was prior to solids, which is surely significant? Were some infants already considered above expected weight and this has continued with solids, or has there been an increase since introduction? Were those underweight already so before solids? If something is underlying such as a hidden tongue tie, not only may that influence weight pre solids, but may also impact on method of introduction; if baby is orally sensitive they may have refused a spoon and thus be baby led weaned as a result rather than a choice. "But notice what the study didn’t show. It didn’t show that the graduates of baby-led feeding were more likely to eat vegetables (they weren’t). Nor did it show that baby-led feeding made kids more interested in nutritious, balanced diets. Or that spoon feeding increased a child’s chances of becoming a picky eater. When it came to these variables, the two groups had similar outcomes. And maybe we shouldn’t be surprised. It’s not clear to me that letting babies feed themselves is going to turn them into exemplary eaters. What makes children accept healthful foods is repeated exposure, social cues, and pleasant experiences. There are many good reasons to offer your baby safe finger foods. Self-feeding is stimulating for the baby and fun to watch. 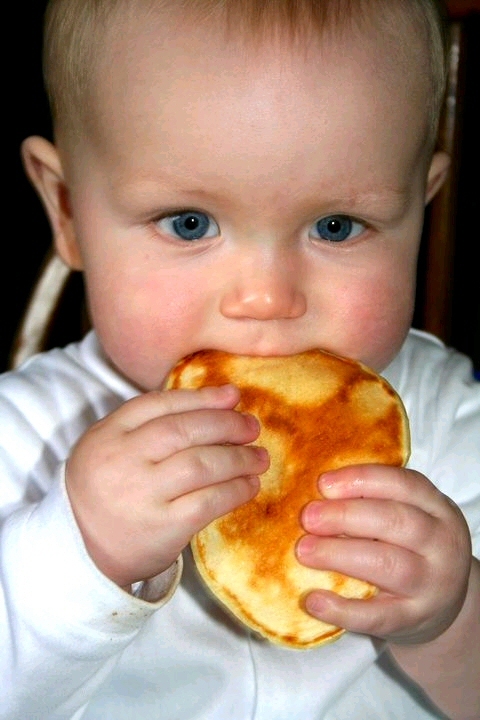 But we shouldn’t assume baby-led feeding is the key to good eating habits. Or that the spoon is the road to ruin." "Interestingly, the baby-led group showed increased preference for all food categories except sweets compared to the spoon-fed group (although this was only significant for carbohydrates)". "Our findings show that baby-led weaning has a positive impact on the liking for carbohydrates—foods that form the building blocks of healthy nutrition (ie, those found at the bottom of the food pyramid). This is a significant finding since, to date, the factors thought to be most influential on early food preferences are sweetness and familiarity (exposure). Consistent with previous research, the spoon-fed group preferred sweet foods most, whereas the baby-led group most preferred carbohydrates (even though significantly higher exposure to carbohydrates was reported in the spoon-fed group)." "Our results suggest that baby-led weaning promotes healthy food preferences in early childhood that could protect against obesity. This finding is of note given the serious problems with childhood obesity facing many modern societies." Whilst as discussed the study is limited - I definitely think it's an interesting foundation. To me there are many logical reasons for letting a child self feed, potentially improved appetite regulation longterm is one, and it also makes sense to me that it is much easier to overeat if someone is spoon feeding you. The ability to consume more calories for the "full feeling" is the reason on diets such as Slimming World, you can have unlimited whole fruit but v limited amounts of smoothies. Similarly if you're ill often they are recommended as an easier way to increase intake of nutrients and calories. Many mums also note constipation in purée weaned babies (indicating the solid/fluid balance has shifted too far), whilst this is virtually unheard of in self feeding infants. "How did hunter-gatherers make baby food mash? No special technology needed. 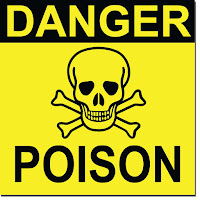 The mother took a bite of the unprocessed food, chewed it into a pulp, and then spit it into the baby’s mouth." So for each mouthful the mum has to chew and process the food before passing to baby - which provides a natural gap after each mouthful, much like if baby were eating it themselves. Plenty of time to recognise they're full. 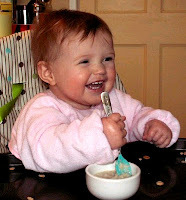 Compare this to a mum feeding her baby puree from a bowl, and the speed with which the spoon is reloaded and returned. Also, sure cavemum prechewed foods such as meat and roots - but is there anything to suggest she did this for ALL foods? Logically to me you would do this for something hard to break down, but why if something was already soft? Even after mastication, meat is not that completely smooth texture of a purée? 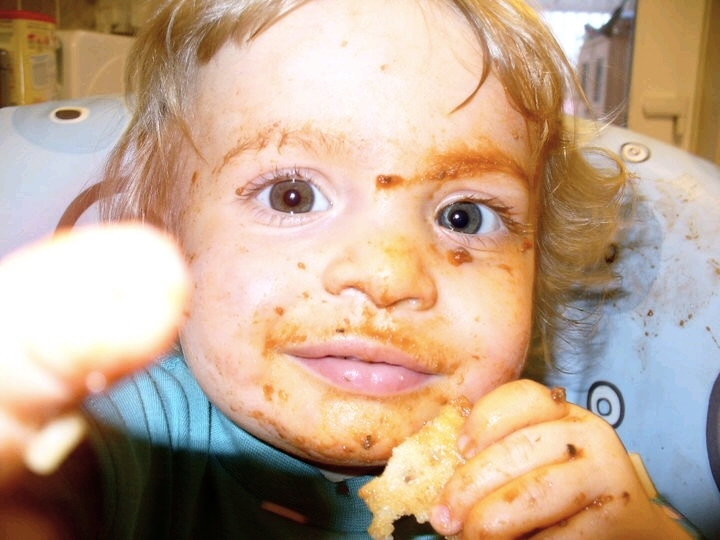 We know when babies are getting ready to eat they begin a chewing action, they often do it when you're eating - why if they're only meant to eat foods which requires swallowing with no chewing at all? Perhaps a study on jaw development between spoon fed and purée weaned infants may also be interesting (particularly if earlier feeding methods were also included in the study)? Furthermore what effect does today's puree practice have on foods? "The more processed a food is, the quicker it can raise your blood sugar levels. Fruit purées are more processed compared to whole fruits, but not as much compared to fruit juices. In other words, fruit purees can raise your blood sugar levels faster compared to fresh fruits, but not as fast as fruit juices. Unfortunately, fruits lose a lot of their fiber and nutrients when processed into a puree. Opt for whole fruits as much as possible, because their higher fiber content will help prevent a large increase in blood sugar levels. If you prepare your own fruit purees, keep the peel on, after washing it thoroughly, to increase the fiber content of the purees. Some mums are told to blend and then put through a sieve or moulee, removing fibre and resulting in a product more comparable to juice. There also seems to be some discussion over whether "resistant starches" are broken down in a food processor, thus making them available and increasing calorie content by more than 5%.- however I haven't had time to go into a long evidence based hunt for this, so you would need to if you want to know more! Foods in their whole food format, such as toast, rather than a pureed form may highlight awareness of perceptual features (such as texture) that is masked when food is pureed. "A great variability in the consumption of chopped carrots was found within the infants. Analysis showed that familiarity with different textures, especially chopped foods, is the strongest predictor of intake and liking of chopped carrots." "The present research is a first step to explain the variation in infants’ consumption and liking of different textures. It highlights the importance of not only varying the child’s experiences with different flavours but also with different textures to foster the infants’ transition to an adult diet." I think there has to be some instinct mixed in with the research. I did purée feeding with my first and baby led with my second, and I would never return to mush again! 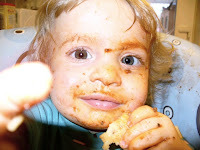 There are no prizes for ignoring your instincts and presenting baby with a selection of foods because they are what you think you should be giving in order to do "pure" baby led weaning. If a mum feels more confident initially giving something a rough mash with a fork before letting baby self feed, which builds confidence and develops into more sliced/whole foods as baby develops - this is surely better than mum think she doesn't want to do whole foods and so needs to purée and spoon herself? Something else I haven't seen discussed much from the study is choking. "93.5% of the baby-led group reported that their child had never experienced a choking incident (a serious concern for parents and practitioners"
It's a real shame they didn't also collect this figure for the purée weaned - as my first had a choking incident when she began more solid foods at around 8 months. "A large controlled prospective study is now required, which examines weaning practices in tandem with the other key factors, including BMI, milk feeding practices (breast vs bottle/formula fed), socioeconomic status, locus of control and picky eating. In particular, a study is needed that includes a greater proportion of children who have been formula/bottle fed in order to compare the relative impacts of weaning method and milk feeding practices on food preferences and health outcomes in early childhood"
1.I. Blossfeld, A. Collins, M. Kiely, C. Delahunty, Texture preferences of 12-month-old infants and the role of early experiences, Food Quality and Preference, Volume 18, Issue 2, March 2007, Pages 396-404, ISSN 0950-3293, 10.1016/j.foodqual.2006.03.022. One thing really stuck out to me in this article, and that was the part about carbohydrates. It's very outdated for carbohydrates to be placed at the bottom of the food pyramid. A diet high in carbohydrates is essentially a diet high in processed food, sugar and grain, none of which are good. Our diets should be primarily made up of meat and green veg. Vegetables should be on the bottom of the pyramid followed by meat, then healthy fats, then fruits. It doesn't say the diet was high in carbs though, it says this was a preferred food for the BLW group compared to sweets in the non BLW group.